blog.HalloweenAdventure.com | Latest News from the Costumes Trend FrontLines! : Deck the Halls for Halloween! Deck the Halls for Halloween! Spice up your home this season with a variety of Halloween themed decorations from Halloween Adventure! Our website offers everything from silly faux- tombstones for the front yard to light strings for the porch to cats for the kitchen. Hang our Skeleton Spider from the kitchen fan. Next time someone turns the fan on, they’ll get a little skeleton surprise! This toy is also great for the front porch as a way to attach trick or treaters. If you really want to give them a scare, try our Latex Ghoul. We’d recommend putting him anywhere from the foot of the stairs to smack dab in the middle of the front yard, or perhaps even next to the mailbox. He’s not as mean as he looks, we promise! 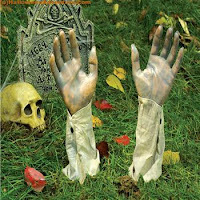 If the ghoul is too much for you, try “planting” our Gruesome Ground Breaker in the front yard. This package contains two hands, each one on a small 2” stake. They’re spooky as can be! Talk about raising the dead! Throwing a Halloween party? Decorate in style with our Halloween Pumpkin Bunting. This is an adorable way to jazz up a space! 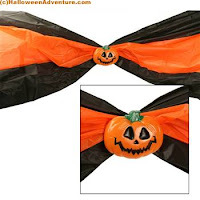 Black and orange bunting measures approximately 20' long with 5 pumpkin tie-backs that have self-gripping fasteners. The best part? You can reuse it again and again, so if your parties become infamous, your bunting will too! 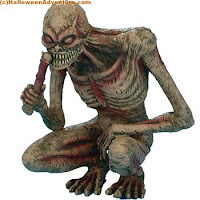 Scare them as soon as they come up the front steps with our Hanging Grey Reaper. 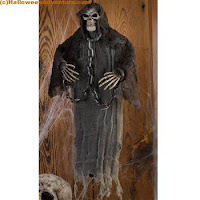 20" Hanging Gray Reaper is wearing a shredded gray gauze shroud with attached hood. Reaper measures approximately 20" high. Made of plastic with a gauze robe and hood. Has plastic shackles connected to neck and wrists. This guy is absolutely as freaky as it gets. 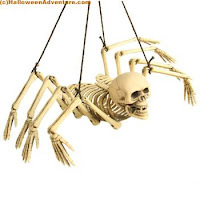 Get ‘em good with our Posable Spiders. Spiders are the one thing almost everyone is scared of, so they’re the perfect addition to a Halloween party. Place them next to the punch and watch people jump, or stick them on the floor when everyone is walking around. You can also attach them to a string and dangle them in the doorway. Yikes!